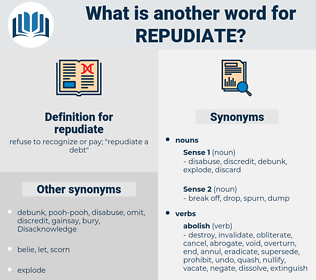 What is another word for repudiate? refuse to recognize or pay; " repudiate a debt"
disapprove, denounce, oppose, disagree, deny. 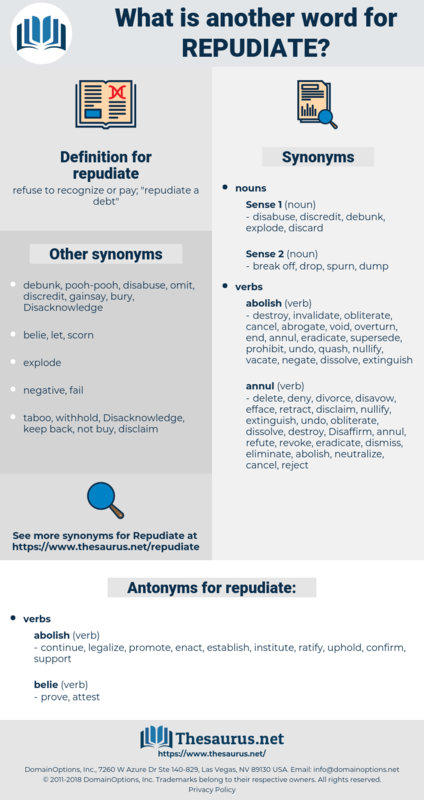 refute, rebut, renounce, negate, dismiss, overthrow, overrule, renege, reverse, denounce, relinquish, topple, waive, discard, repel, oppose, forego, abdicate, abandon, repeal, deny, repulse, dispel, forgo. continue, legalize, promote, enact, establish, institute, ratify, uphold, confirm, support. allow, permit, accept, welcome, ask in. concede, vouch, corroborate, verify, reconcile, sign, agree, ok.
assent, assist, help, aid, endorse, consent, concur. approve, authenticate, protect, receive, claim, grant, validate, haunt, proclaim, adhere, advocate, undertake, keep, countenance, pursue, prosecute, court, seek, announce, defend, substantiate, vow, submit, select, occupy, take, cherish, condone, acquiesce, back, accede, vindicate, favor, hold. But men sometimes act on ideas they repudiate, and with very good results. I am a man of peace, I am the enemy of war - it is my faith and creed; yet I repudiate the principle put forward by the Earl of Eglington, that you shall not clinch your hand for the cause which is your heart's cause, because, if you smite, the smiting must be paid for. rabid, raft, repudiated, rabbitwood, rub out, rebato, robed, raw beauty, rabbit, rift, reboot, rarified, rabbet, repeat, rapid, rapt, repute, rubato, rebate, rabbit-weed, riptide, repot, rapidity, rope tow, rivet, refute, rabbitweed, rabat, Rabidity, rarebit, roofed, rabato, revived, raphidae, Ribbed, raphidiidae, ribbed toad, robot, refit, rabbiteye, raped, ruby wood, rip out, rebut, rarefied, reputed, repeated, rowboat, Revet. tergiversate, abjure, deny, take back, unsay, recant, refute, forswear, retract, resile, swallow, apostatize, rebut, apostatise, withdraw.